LEGO is a powerful tool for playful learning, especially when it comes to learning to read. We recently partnered with Care For Education to incorporate LEGO Duplo into our Book Boxes at schools and external partners. With this exciting new addition to our literacy toolbox, it’s key that we are fully equipped with the knowledge we need to use LEGO effectively in our one-on-one reading sessions. 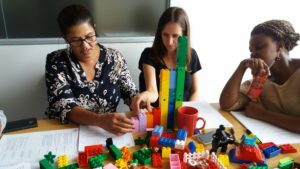 To assist with this, help2read staff and Literacy Tutors attended training in early March to become LEGO facilitators, able to go on to train volunteers on how to use LEGO for literacy. 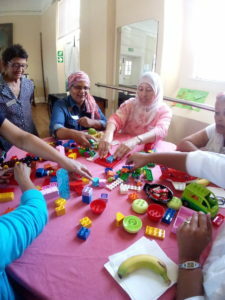 We were thrilled to host our first LEGO workshop for volunteers on 27 March at St Mary’s Primary in Cape Town. During the workshop, volunteers had the opportunity to experience first-hand how learning through play can be beneficial. At the workshop, volunteers participated in a host of activities using LEGO that they can replicate in their reading sessions. In addition to helping children master the above skills, the LEGO activities also address key concepts such as left-right, up-down, over-under and many more, which form part of the learning that assists children to read. The use of LEGO Duplo in the help2read programme wouldn’t be possible without the amazing donation of Duplo Charity Boxes, which are specifically designed for use by younger children. The Charity Boxes are packed by retired LEGO employees in Denmark and consist of new LEGO Duplo bricks and elements that have been selected from unused returned goods and/or discontinued elements. No two boxes are the same, which makes opening the box and discovering its colourful contents very exciting! We look forward to working with our wonderful volunteers and Literacy Tutors to effectively use LEGO in our reading sessions.